Residents and business owners in La Grange, IL can count on Polar Heating And Air Conditioning for affordable boiler repair, boiler installation, and boiler maintenance services. We employ Nate Certified Boiler technicians that can install or repair any make or model of hot water or steam boiler. If you are in the market for a new boiler installation, our prices can’t be beat. If you need a boiler repair, you can trust our team to do everything to restore your heat 24 hours a day, 7 days a week. We invite you to experience the Polar Difference for yourself and see why so many people in La Grange, IL choose Polar for all of their Boiler needs. When the time comes to replace your existing boiler, or install a new radiant heating system in your home, you can trust the boiler installation experts at Polar Heating and Air Conditioning to get the job done right. At Polar, you can always expect the absolute best prices on the best equipment available. 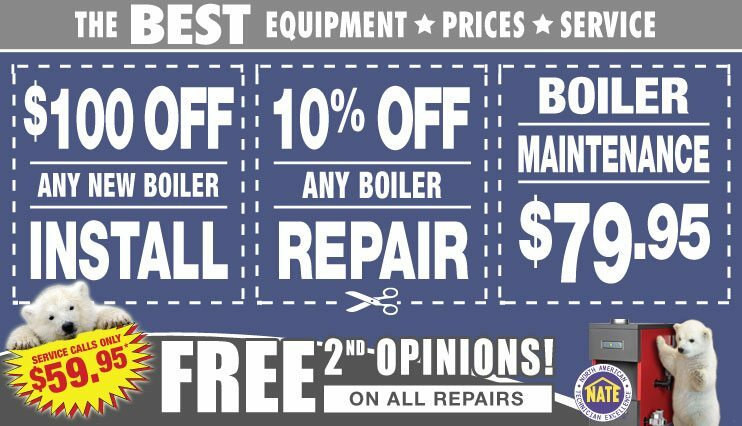 We offer Free boiler installation estimates in La Grange, Il for all residential and commercial customers. Our heating and cooling technicians have been installing hot water boilers and steam boilers for over 60 years. We have thousands of satisfied customers through the entire Chicagoland area and we can’t wait to serve you. Come experience the Polar Difference for yourself, Contact us today for a FREE estimate. Homeowners and business owners in need of boiler repair service in La Grange, IL depend on the HVAC experts at Polar Heating and Air Conditioning. At Polar, we offer all customers reliable and affordable boiler repair services that can have your heat restored quickly. Never will you be charged extra for an evening or a Saturday appointment. That means that you can schedule your boiler repair appointment at a time that works best for you. We also offer 24 hour emergency service. Whatever your problem may be, we can get you up and running again. Has another boiler repair company in La Grange, IL inspected your unit? If so, we offer FREE 2nd opinions on all repairs. Contact us today to schedule an appointment. Do you want your boiler to run smoothly all winter long? How would you like to avoid having to call a boiler repair service this season? If so, it is imperative to have annual boiler maintenance performed. Not all boiler maintenance service in La Grange, IL is the same. At Polar we offer a comprehensive boiler cleaning and boiler inspection that will keep your unit in top shape and under warranty. When you choose Polar Heating and Air Conditioning for your boiler maintenance needs, you can rest assured that you are receiving the best value. Stop overpaying for lesser service. Contact us today to schedule your annual boiler maintenance today!